I wrote about these two titles that I worked on last year in the post My Work in 2009, so check it out if you want to read a little about them—the news today is they’ve both been nominated for Origins Awards; Eclipse Phase (Rob Boyle, Brian Cross, John Snead, and more!) in the Best RPG category and Seattle 2072 (written by Steve Kenson with a bunch of authors contributing short fiction) in the Best Sourcebook category. I’m really damned proud of these books and the teams that worked on them—thanks to all of the contributors! By the way, Eclipse Phase is Creative Commons-licensed, so if you want to grab the PDF for free, not only will I not stop you, but I’ll outright encourage you to do so! 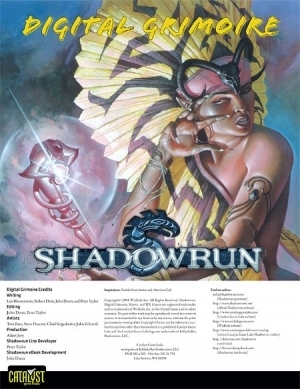 The project that has taken so much of my time and energy over the last few months has now been announced, and is available as a PDF: Catalyst Game Labs Celebrates 20 Years of Shadowrun!